Wapakoneta’s Curtis Hughes returns a shot to Ottawa-Glandorf’s Parker Schomacker during Monday’s match at the Community Courts in Ottawa. Ottawa-Glandorf’s Colin Welch returns a shot to Wapakoneta’s John Doll during Monday’s match at the Community Courts in Ottawa. Ottawa-Glandorf’s Parker Schomacker returns a shot to Wapakoneta’s Curtis Hughes during Monday’s match at the Community Courts in Ottawa. OTTAWA – The Ottawa-Glandorf boys tennis team was coming off a title in the Van Wert Invitational when they hosted Wapakoneta Monday night at the Ottawa Tennis Courts. The Titans were looking to solidify their unbeaten start to the 2019 season, as well as take a major step toward a Western Buckeye League title, against the Redskins. Led by second singles player Parker Schomacker, the Titans got it done with a 4-1 victory on a sunny but chilly and windy afternoon. Despite the loss, Wapakoneta head coach Elise Minick was pleased with her team’s spring. Schomacher had to rally to defeat Curtis Hughes 4-6, 6-1, 6-2. Other winners for the Titans (9-0, 4-0 WBL) were lefty third singles Colin Welch over John Doll 6-2, 6-2; the first doubles of Drew Kuhlman and Kameron Maag over Austin Hancock and Noah Kirby 6-2, 6-2; and the second doubles duo of Sam Schmenk and Nolan Unterbrink over Logan Shirk and Jesse MacKenzie 6-4, 6-0. Minick knows her team is in for an interesting week as the post-season looms. 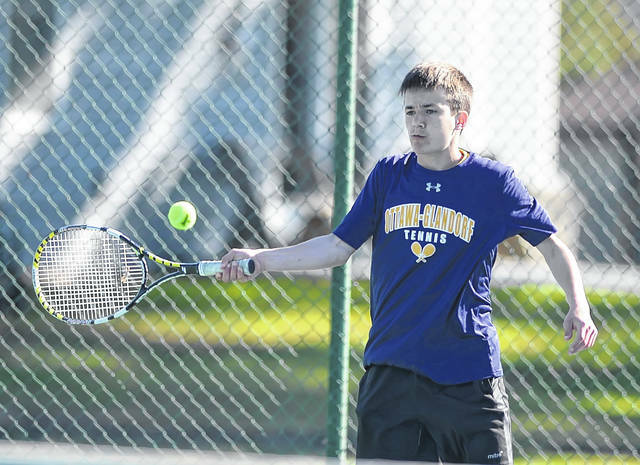 The one victor for the Redskins (6-3, 3-1 WBL) was first singles Jeffrey Adkins, who downed Carter Welch 6-1, 6-3.
https://www.limaohio.com/wp-content/uploads/sites/54/2019/04/web1_OG-Tennis-RP006-1.jpgWapakoneta’s Curtis Hughes returns a shot to Ottawa-Glandorf’s Parker Schomacker during Monday’s match at the Community Courts in Ottawa. 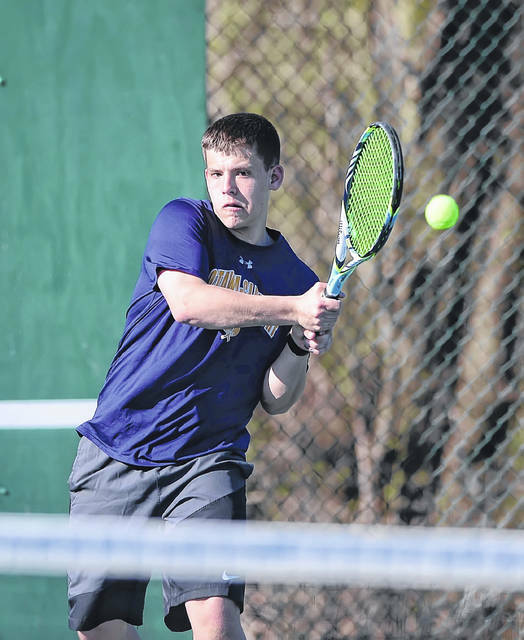 https://www.limaohio.com/wp-content/uploads/sites/54/2019/04/web1_OG-Tennis-RP007-1.jpgOttawa-Glandorf’s Colin Welch returns a shot to Wapakoneta’s John Doll during Monday’s match at the Community Courts in Ottawa. 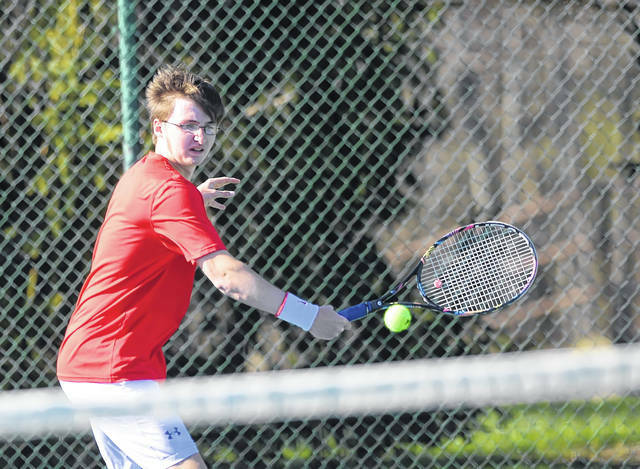 https://www.limaohio.com/wp-content/uploads/sites/54/2019/04/web1_OG-Tennis-RP005-1.jpgOttawa-Glandorf’s Parker Schomacker returns a shot to Wapakoneta’s Curtis Hughes during Monday’s match at the Community Courts in Ottawa.